Georgetown, August 9— following her history-making performance in the 2013 CESC examinations, 17 year-old Zimeena Rasheed is now off to create new milestones and she does so with the help of Caribbean Airlines. Rasheed, who is the first student ever to pass 21 CXC subjects in one sitting, will be travelling on Caribbean Airlines from Georgetown to Miami, where she will take up a full scholarship offered by Florida Institute of Technology. 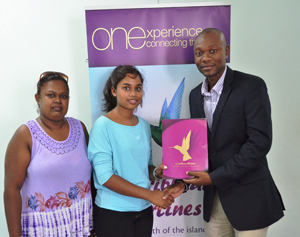 Caribbean Airlines has provided a return ticket to assist her with the next chapter of her successful journey. Ms. Zimeena Rasheed made history as the first in the Caribbean to have passed 21 subjects in one sitting of the CXC Examinations in June 2013. She obtained 18 Grade 1 and 3 Grade 2 passes. Her outstanding performance came to the attention of a Guyanese in South Florida, who passed her information to a University here who were completely awed by this accomplishment. As a result, The Florida Institute of Technology, College of Engineering has offered Zimeena a full scholarship – Tuition and Board. She is scheduled to travel on Saturday, August 9 to Miami, Florida to begin her tertiary education.